PropLand Hub is an innovative web-based mobile application that facilitates all real estate deals and services. The app is a product of PropLand Hub Limited, a company duly incorporated in Nigeria with registration number RC 1474139. It allows property seekers to browse through all types of listings by property owners for sales/purchase, rent or lease. Actually, it does even more, and it is free to download! Released on May 18, 2018, the mobile app is indeed a user-friendly platform that connects property owners, caretakers, contractors and estate agents with potential buyers, renters, lessees, and tenants. Whether it is a land, a house, an apartment, a room, a shop, or an office space, PropLand Hub is the dealing platform to go to. The app also enables users to easily hire the services of construction workers such as architects, masons, carpenters, plumbers, etc., as well as connect with sellers/lessors of building materials such as roofing sheets, woods, tiles, scaffold, etc. This functionality is most handy for users who want to continue work on a yet-to-be-completed construction, or do some renovation or maintenance works. In addition to these exciting features, the app also helps users easily find a roommate! Sounds great, not so? 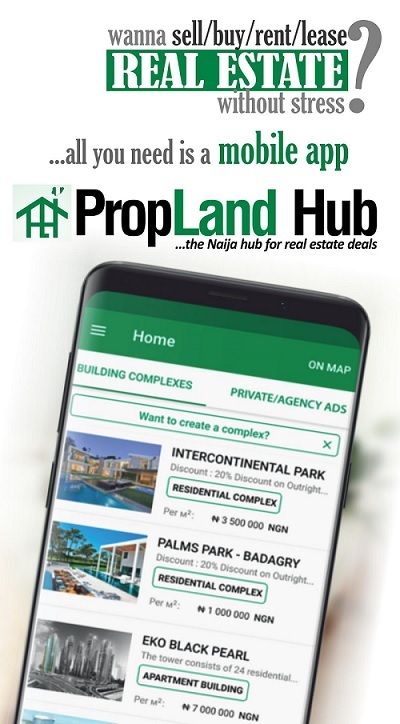 Built by VEON-certified MnT Modern Technologies Limited and released by PropLand Hub Limited, two digital solutions firms duly incorporated in Nigeria, PropLand Hub is prided as the Naija hub for real estate deals and services. It is indeed fair to say that the app measures up to that descriptor. For one, PropLand Hub is very easy to use, and has really exciting features and functionalities. Moreover, as a web-based mobile app, all the listings on the app are automatically integrated into the website (www.proplandhub.com), which means a dual medium of connectivity. Indeed, the introduction of the app is bound to mark a watershed in the Nigerian real estate industry. ⦁ Browse/Scan through properties listed for rent or purchase anywhere in Nigeria. ⦁ Filter Search Results based on preferred criteria and keywords. ⦁ Get Alerted when a new property listing is available based on your desired location or price range. ⦁ View Photos of each advertised property. ⦁ Map View: Locate every listed property on the map. ⦁ Unlimited Access: Login into your account across all of your devices. ⦁ Connect: Interact easily with property owners with functionalities such as call, live chat, leave a message, or request a call-back. ⦁ Manage Listings: Create, edit and delete property listings for sales, rent or lease. ⦁ Monitor Seekers’ Requests: Keep tabs on every request from property seekers on your property. ⦁ Connect with and Hire the services of construction workers such Architects, Masons, Plumbers, Painters, Electricians, Carpenters, Welders, Interior Decorators, Aluminium Fabricators, Cleaners, Fumigators, Repairmen, Horticulturists, etc. Builders of the mobile app equally offer major property investors, developers and contractors who have or are constructing residential complexes and estates mutually beneficial partnership arrangements. This, according to the tech team, is in order to provide suitable premium services for all types of residential complex and estate regardless of size or value.